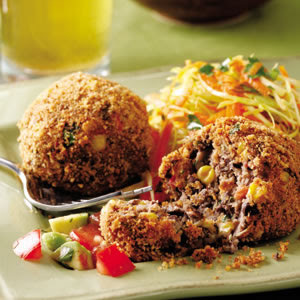 A spicy, healthy croquette...who knew it possible? Another delight recently tried south of the border. I've never had anything like it. I make my own salsa which could not be simpler using 3 Ugly Vine tomatoes, cilantro, salt, and cayenne pepper. If you make your own, use it, but the salsa served with this incredible dish is listed below. Buen Provencho! Mash black beans and cumin with a fork in a large bowl until no whole beans remain. Stir in corn and 1/4 cup breadcrumbs. Combine tomatoes, scallions, cilantro, 1/2 teaspoon chili powder and salt in a medium bowl. Stir 1 cup of the tomato mixture into the black bean mixture. Mix the remaining 1/3 cup breadcrumbs, oil and the remaining 1/2 teaspoon chili powder in a small bowl until the breadcrumbs are coated with oil. Divide the bean mixture into 8 scant 1/2-cup balls. Lightly press each bean ball into the breadcrumb mixture, turning to coat. Place on the prepared baking sheet. I like your blog layout and colors. Your pics are excellent - very sharp. I should get a new camera!!! Sangria is the best!! And your kid is a cutie. Very brave to travel with him. Your a better sport than I!!! Very good post. Looking forward to the next one.